Ships from and sold by electroau. 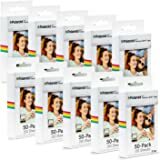 SMARTPHONE MEMORIES MADE REAL - Using the Polaroid ZIP is fast and easy! 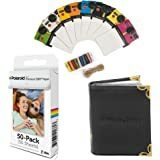 Just connect a smart phone or tablet via Wi-Fi and watch your portraits, selfies, and social media photos transform from digital images to physical pictures in an instant. STUNNINGLY VIBRANT PRINTS - ZINK ZERO INK printing technology eliminates the need for film, ink, toners, cartridges, and ribbons. The premium 2x3ʺ sticky peel-back paper prints are not only colorful, bold, and lifelike, but are also water-resistant, tear-resistant, smudge-proof, and dry to the touch. 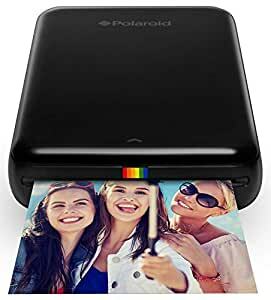 FREE POLAROID MOBILE APP - Take your photography to the next level by downloading the FREE Polaroid app, compatible with iOS and Android. No computer connections needed- download the app and unlock all the customizable and adjustable editing features Polaroid has to offer. From stickers to filters to borders, photo editing is easy, fun, and as endless as your creativity! TRAVEL-READY DESIGN - The mini and pocket sized design is compact, super portable and perfect for anyone who loves to travel, blog, do DIY projects, or go on adventures. The small size makes it easy to carry, so you can share your favorite pictures whether you're indoors, outdoors, at a party, on vacation, or at any other event. SHOP WITH CONFIDENCE - Only Polaroid products offered by authorized dealers are covered by its manufacturer's warranty. Products from unauthorized re-sellers may be counterfeit, damaged, altered, or previously used. A list of authorized distributors is on the manufactures website. Just took the perfect selfie? Pics or it didn't happen! 5.0 out of 5 starsEdit on your phone, not within the app. I was iffy about buying this after reading all the reviews saying the images printed dark. The trick is to make the image lighter on your phone, do not edit within the app. The picture on the left was made brighter within the app and the one on the right was edited on my phone first. Love this product. 628 people found this helpful. 5.0 out of 5 starsFun printer, Make sure you download the updated App! This is a really fun little printer! The print quality is good and suited for the purpose of instant photo gratification. If you are expecting studio quality prints than this probably isn’t for you. 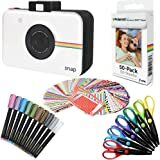 But, if you’re looking for an instant camera to print photos at parties, for crafts, and to get your pics out of the digital space then give this printer a try. You can edit photos to your hearts content in the app prior, and because you are using your phone camera the picture quality/zoom/colors come out nicer than with a point and shoot instant camera. 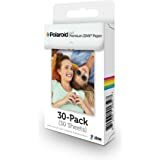 The paper is more economical than other instant camera options, around $22 for a 50 pack of paper. Make sure you scan the QR code on the back of the box and download the correct app, “Polaroid Zip” NOT the QR code from the instruction booklet- it is outdated and the app doesn’t work. The Correct app is called “Polaroid Zip” its black with a rainbow icon for iPhones. There are two versions in the Google Play App Store, if you download the wrong one you won’t be able to print! - I already left the seller a great feedback since this item got shipped in the same day ordered even though i had a free (5 to 8) days shipment on. So thank you alot. - The printer is very user friendly. U dont really need a manual for it. As long as you have NFC in ur phone. Or bluetooth. Just connect it. And it'll open the app. Automatically, or take you to the app market to download the free app. - The app. Itself is kindda slow and needs alot of tweeking but gets you the job done. It also have alot of options and editing tools which i was surprised they were included, anyways this is a review of the printer not the app. (I would give the app. A 3 stars though, you need to check the app. To know what i mean). - Okey so i opened the box and found the free pack of paper in there ready to be put inside. This is probably the only tricky part of this whole thing. Once you put the paper inside as shown in instructions on the pack, you are ready to go. - Just NFC the printer with ur phone and the app will open. Choose your options, edit, and customize your picture then click print on your phone. The pic will come out like a rabbit being pulled out of a magician's hat, leaving the crowd anxious to see the pic, and experience the (zink) I've been bragging about XD. My cons. to this product, and why its 4 stars instead of 5. Well don't expect to see the same picture in your vivid and lively colored phone screen coming out of this printer. I mean its portable after all and it got its limitations. The pics tend to get a tad reddish by default. Although you can tweek this through the app. Its still annoying and you could waste few papers (a pack of 20 for 10$) on trails.I've added a pic that might show you the difference. Oh and if you are raeding this. Don't edit the pic, and fit it FULLY in the app. Leave some frame to it in the app. Unless you don't care about it getting cropped a bit. It also shows in the pic attached. 810 people found this helpful. 5.0 out of 5 starsA nice portable battery powered photo printer for your Apple or Android devices! The printer comes with a very brief instruction manual that doesn't contain any detailed technical information. There is a QR code that you can scan to get the app for your smart device. The printer comes with one pack of 10 sheets of Zink, Zero Ink, paper that you load into the printer. In my past experiences you will lose you photos quickly as your friends will take them from you for themselves so buy some extra paper. There is also a 31 inch charging cable in the box to charge the internal battery of the printer and it will charge in about 1.5 hours. You can use any USB wall charging source, your computer or your car's USB charger. Printing a photo is fast and easy and you can also edit them using the free app. I show some of that in my video. This is a good small printer and I rated it at 5 stars. The only two cons that I have are that the instruction manual is very limited. This seems to be a common issue with Polaroid equipment. The second issue is that the printer disconnects from the Bluetooth connection in a very short period of time and I had to reconnect several times while making my video. When I say short and mean in a few minutes it was disconnected. I still rated the printer at 5 stars as reconnecting was fast and easy and I assume that it disconnects quickly to conserve battery power. I was supplied a sample for test and evaluation. A review was not promised to the supplier in exchange for the sample but I stated that if I provided a review that it would be fair and honest. 1,327 people found this helpful.